A few months ago, I attended an unusual high school reunion. It was a special ‘tea’ for the alumnae of a girl’s high school which was getting its first major renovation in more than fifty years—and the grads were invited to see the plans. The school had gone co-ed, merging with a boy’s school in 1974, so the youngest of the more than 40 alums who turned up was about 60, and many were a decade or two over that. Their concern for their old campus was heartwarming, and yet I couldn’t help wondering what really brought them out. The women took in the plans for the new additions politely enough, but the renderings for the new addition, while attractive, didn’t draw any questions. It became clear that what the grads really wanted was reassurance about one thing: would the original old buildings remain? 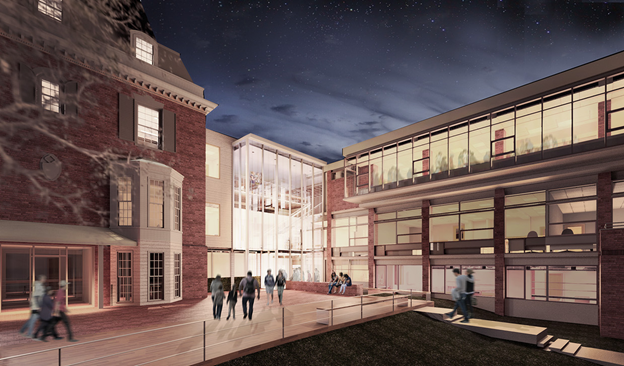 “Yes,” the alums were told that the 19th-century house and carriage building would still stand but additions from the sixties would be demolished and replaced with newer ones. Everyone seemed delighted. But why did the alums not mourn the loss of those earlier additions that they’d used? These buildings had provided some of the more serviceable classrooms and homerooms for decades. What was it about the century-old buildings in the front and side yards that hooked them emotionally forty or sixty years later (some alums were from the class of 1950)? Day in and day out, the old edifices work hard to meet our intrinsically human pre-conscious requirements for recognition and connection. The human brain as an animal brain has no choice but to look out at the world as an animal, which means we’re on alert for survival, continually at the ready to see other animals that could be in our midst. (We evolved in the wild, where the behavior’s requisite.) Our eyes are not consciously controlled for the most part, indeed, more than 90 percent of our brain activity is outside of conscious awareness. So when we look at buildings that suggest a face, hundred-million-year-old habits kick in. We start to feel a connection, maybe even a little love, or at least in relationship with the object. We ‘reify’ the building, or begin thinking that it’s real. (Car manufacturers design to this feature, especially the front headlight view.) No wonder, then, that the alums showed up; they had to. They cared. With no conscious instruction, their brains had bonded to two of the school’s front-ends. New addition; BBN Middle School: photo: Austin Architects. 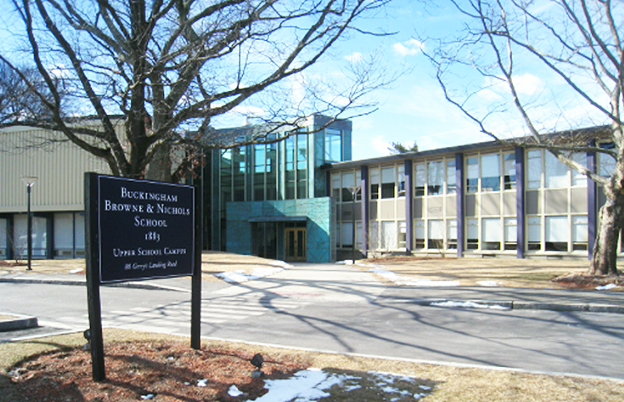 The same holds true for the high school’s main entry building on another part of the campus (shown below). So when the Board of Trustees hold a coffee about its renovation in say, 2050, we’ll bet on the following: no one from the class of 2000 will show up. Why? Because their minds —quite literally— have already been made up.